Bryan Talbot has just released this sneak peek at his new Grandeville book, Bête Noire (due for release 6th December in the UK from Jonathan Cape), on YouTube. At Toad Hall, lair of multibillionaire Baron Aristotle Krapaud, a cabal of industrialists and fat cats plot the violent overthrow of the French state by the intervention of horribly beweaponed automaton soldiers. Meanwhile, the brutal murder of a famous Parisian artist, mysteriously stabbed to death in his locked and guarded studio, is subject to the investigations of the tenacious Detective Inspector LeBrock of Scotland Yard, placing him and his faithful adjunct, Detective Sergeant Roderick Ratzi, in pursuit of the mysterious masked assassin stalking the cut-throat commercial world of the Grandville art scene. Bête Noire signals the welcome return to anthropomorphic steampunk detective fiction of master storyteller and graphic novel pioneer Bryan Talbot with the third stand-alone volume of the Eisner and Hugo Award nominated Grandville series. As the body count mounts and events spiral exponentially out of control, aided by his brilliant deductive abilities and innate ferocity, LeBrock battles against outrageous odds in this funny, high octane thriller, an adventure shot through with both high art and comic book references, a glorious illegitimate offspring of Sir Arthur Conan Doyle and Ian Fleming - with animals! Digital comics publishing house Madefire - co-created by British comic creator Liam Sharp - has announced a major update to its revolutionary comics app, bringing it to iPhone and iPod touch for the first time. 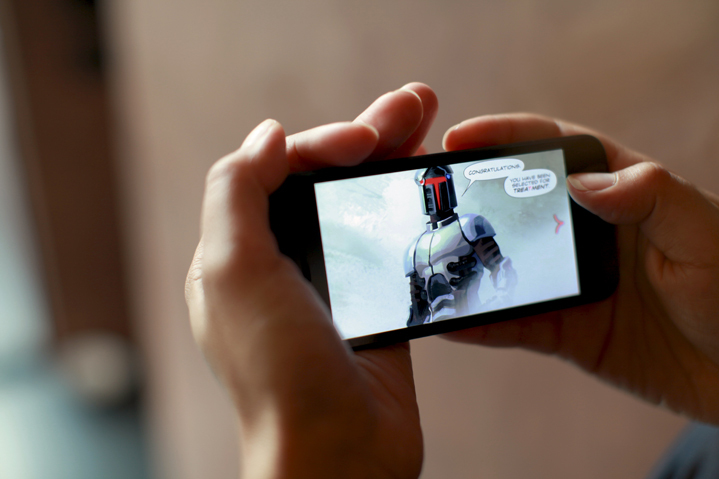 The Madefire app, which delivers a fully-immersive, episodic comics reading experience, is now optimized for the four-inch Retina display on iPhone 5 and supports Facebook single sign-on in iOS 6. The app is also available for iPhones 3GS, 4, 4S, and for third and fourth generation iPod touch. Madefire's distinctive format features episodic, 'short-burst' (10-15 minute) reading, and utilizes sound, music and motion - as well as special effects, like parallax and panorama, to transport readers deep into story worlds. Madefire says it is also growing its catalogue of free titles and weekly releases of new episodes, giving readers even more opportunities to explore 'short-burst' reading. We've downloaded a couple of stories here at DownTheTubes and it's looking slicker than earlier versions, although we're still not convinced by the size of lettering on the iPhone screen or some of the storytelling decisions when it comes to presenting speech balloons, for example - but there's no doubting the art is gorgeous and we're intrigued by the upcoming beta testing of its Motion Book Tool, which has apparently been heavily oversubscribed in terms of creator interest. As part of Madefire's commitment to democratizing digital publishing within the visual storytelling space, the company is making this browser-based Tool -- on which all Madefire titles are built -- available to creators through a phased release. The app includes a new 'Feed' feature, which gives readers an inside look into Madefire titles and creators, with special features such as 'The Making of' and sneak peeks of upcoming releases. "We received a tremendous response for Madefire on iPad and wanted to bring this amazing content to millions of iPhone or iPod touch users around the world," said Madefire co-founder Ben Wolstenholme. "Plus, with iPhone 5, users will now be able to experience their favorite episodes and stories on the beautiful, four-inch Retina display." "Feedback about Madefire has been extraordinary," said Dave Gibbons, Watchmen co-creator and author of the original Madefire series 'Treatment.' "As a content creator, I am excited to bring my new stories and characters to iPhone and iPod touch users around the world via the Madefire app." Madefire says it is currently the only publisher offering episodic, digital stories in an immersive Motion Books format. Content creators include world-renowned comic and graphic novel artists, as well as up-and-coming artists. 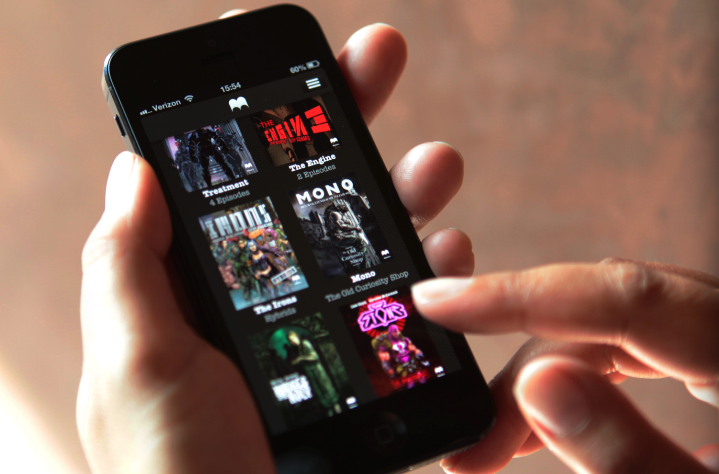 Founded in 2011 by Ben Wolstenholme, Liam Sharp and Eugene Walden, Madefire is backed by True Ventures, with angel investors including Sina Tamaddon, former Senior Vice President of Applications for Apple Inc -- who sits on Madefire's Board of Advisors. The Board of Advisors also includes industry leaders like: Toni Schneider, CEO of Automattic (the company behind WordPress.com); Mike McCue, CEO and Founder of Flipboard; Dave Gibbons, co-creator of Watchmen, the bestselling graphic novel of all time; and Bill Sienkiewicz , widely recognized as one of the greatest innovators of sequential art. Ever watched Wallace and Gromit or Morph (remember him?) and wanted to try animating for yourself? 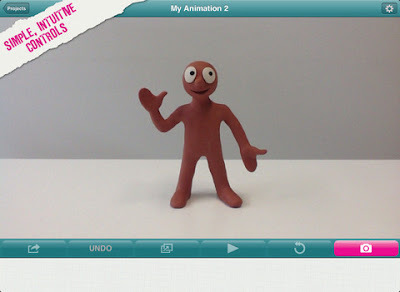 Well, creating a stop motion animation has never been easier (according to Aardman) now that you can get Aardman's Animate It! software on your iPhone and iPad. Use your phone's camera to shoot frames of your animation, using the software to help you line up each shot and stitch it all together. There's also lots of animation hints, tips and inspiration to get you started on the official Animate It website. There's a fine mix of old and new to the latest Commando releases, on sale today in all good newsagents and for iPad and other IOS devices. A Gendarme, a French policeman. That's what Raoul Laurent was when World War II broke out. Sergeant Laurent decided he wasn't going to bow down before the occupying Nazis, escaping to England to join the Free French Forces and become a Commando. Tank, panzer, char d'assault, tahk. Call them what you will, these armoured giants struck fear into all infantrymen who faced them in battle. Not quite all, though. This is the story of four men brought together by the fates of war who challenged the metal monsters and called themselves... 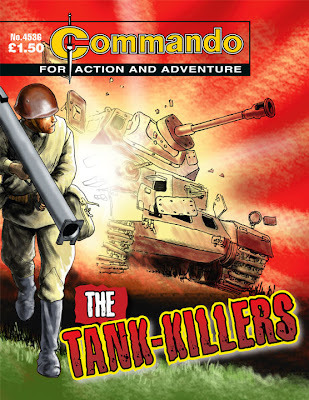 The Tank-Killers! Commando No 4537 - Fly Fast Shoot First! The machine-guns chattered their chant of death, the Spitfire spat its eight-forked tongues of flame - and from the wide blue sky tumbled another charred fragment of the once-mighty Luftwaffe. Mike Arden was a flying fool: a pilot with only one fault. In his eagerness to get into a fight he left more than burned-out Nazis behind him - he left a trail of broken Spitfires too! So they gave him a choice: Transfer to Coastal Command or stay on the ground. Mike transferred - and did things with a four-engined bomber that had never been done before! "I hope nobody minds that I've dipped into 1961 for a story to give a fresh airing but this one really does deserve to be seen again," notes editor Calum Laird of this latest representation of a classic story from Commando. 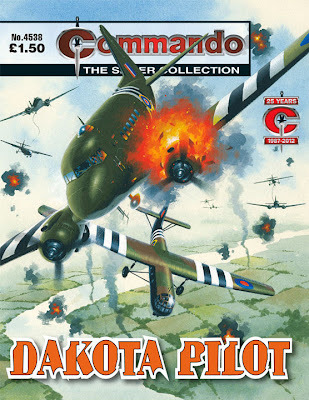 "It's one of very few Commandos to have been written and drawn by the same person and it shows - some of the full-page illustrations which pepper this book are little masterpieces all on their own. If the narrative comes off second-best, it's only because the art treatment is so accomplished. 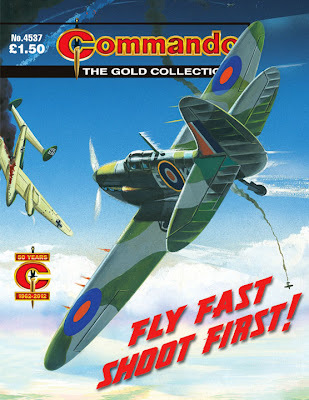 "Oh and there's no truth in the story that Ken Barr's excellent cover features a Spitfire only because we couldn't fit a Liberator in the space." For Ben Smart, Dakota pilot, things had been going badly. Bad luck seemed to follow him wherever he went, and always managed to strike where it could do the most damage. "As usual, Ian Kennedy has done Commando proud with his stunning front cover," notes Depurty Editor Scott Montgomery, "producing an amazing image - a snapshot telling you everything you should expect from the story that appears in between the front and back pages. "Aerial action and thrills abound, of course, but there's also a solid, character-driven story - by writer Bill Fear and interior artist Terry Patrick - about a pilot who believes he is jinxed and wonders if he's a danger to himself and his comrades. 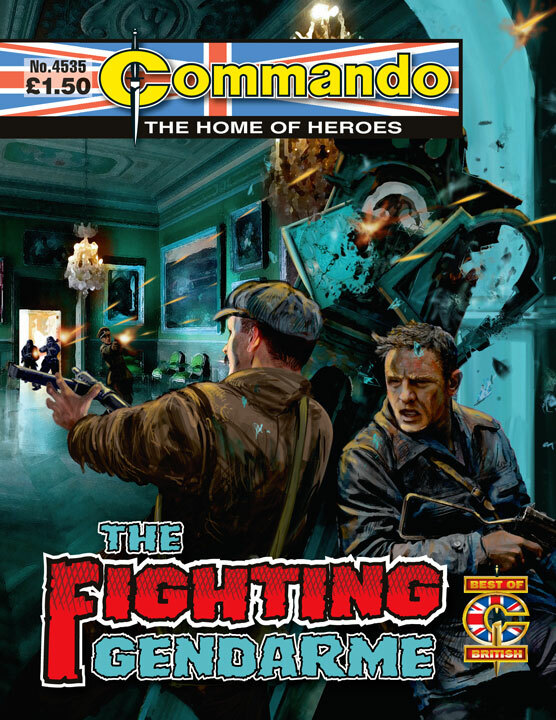 • downthetubes is pleased to offer an exclusive discount on a subscription to DC Thomson's Commando comic, entitling readers to save 50% by ordering using our special discount code! Follow this link to DC Thomson's subscription page. When prompted, enter this unique code COMDT - then make your payment and your subscription will be up and running! 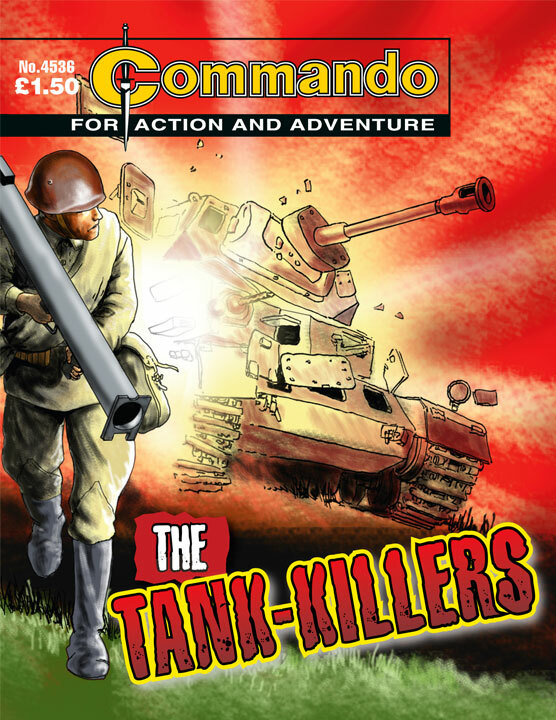 • Commando is also available for iPad and iPhone. The apps are free to download through the Apple iTunes App Store and a digital subscription is priced at £4.99 per month, compared to a £99 annual print subscription. For those not sure there are four free issues to download prior to making a purchase. • Steadfast! the Commando artwork exhibition at The Gordon Highlanders Museum in Aberdeen runs until 30th November 2012. There are more details about the exhibition on the museum website. 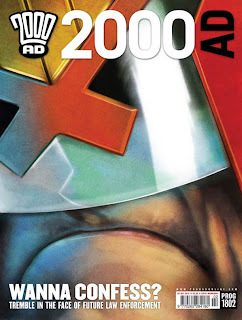 On UK newsagents shelves, online, and via iOS app – 2000AD Prog 1802 is on sale now. The steely glare of Dredd stares out from this latest Prog, which lands today, and Dolman is settling his differences with the Marines in Judge Dredd: Payback by Michael Carroll and PJ Holden. Cadwallader meets a fiery end in Brass Sun: The Wheel of Worlds by Ian Edginton and I.N.J. Culbard, while Hammerstein heads back to the mother planet in ABC Warriors: Return to Earth by Pat Mills and with glorious old school hand-drawn art by Clint Langley. Diplomatic immunity gets pushed to its limit over tea and biscuits in Grey Area: This Island Earth Dan Abnett and Lee Carter, while Bob Byrne returns to 2000AD with another of his Twisted Tales. And after an unfortunate production error (for which the droid in question has been melted down and turned into colostomy fittings), Tharg the Generous is giving fans a free download of last week’s episode of Judge Dredd: Payback by Michael Carroll and PJ Holden! CD Comics latest title set to scare! 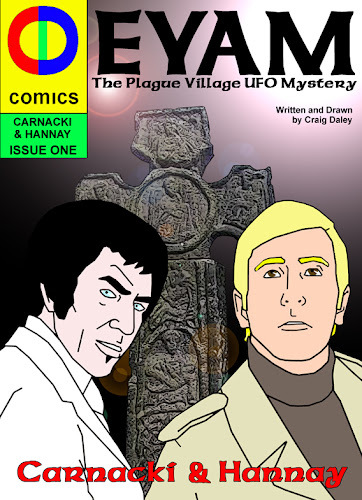 The latest CDComics release - EYAM: The Plague Village UFO Mystery - is now on sale, with a title that conjures images of Gerry Anderson's UFO and Hammer Horror, all rolled into one. In September 1665 the village of Eyam, South-West of Sheffield suffered an outbreak of plague and during the following fourteen months it killed almost two thirds of the population. Eyam: The Plague Village UFO Mystery is set exactly 300 years after the original plague outbreak, and opens with UFOs being tracked on radar over the village. MI6 dispatch their top agent, Richard Hannay and due to the extraterrestrial nature of the mystery they also send for Thomas Carnacki, a private investigator whose speciality is the paranormal. Miss Emma Dodgson, an Oxford, Mathematics and Science graduate is Carnacki’s assistant and the three investigators are faced with an unexplained abduction on a massive scale. The comic tells the story of their combined investigation as history, science and aliens clash in 1965 when the entire population of Eyam disappears. "The mystery concludes in issue two of Carnacki & Hannay, Eyam: The UFO Mystery Solved," says Craig, "when the investigation shifts to Sheffield. This second comic is due for release in November 2012. “It’s sort of South Yorkshire X-Files," says Craig, "with the Eyam plague of 1665 replacing Roswell and you’ll find out in issue two if Sheffield is England’s Area 51!" • The CDrom of Eyam: The Plague Village UFO Mystery includes both JPEG and PDF formats of the 37 page full colour comic and is on sale now, priced £2.50 and is available from Sheffield Space Center on the Wicker, Rare and Racey on Devonshire Green, Broomhill’s Galaxy 4 and Record Collector, The Funhouse, Woodseats and the Blackwells on Mappin Street. The comic is also available to download from Amazon for Kindle, iPhone, iPad and other digital formats. Anyone interested in the crossover between justice and graphic fiction might be interested in the new Graphic Justice project, instigated by Thomas Giddens at St. Mary's University College, Twickenham. "Comics, cartoons, graphic novels, and other visual narratives, have had a considerable impact on cinema, books, and the internet," he says. "They form a significant-and growing-element of popular culture, yet the intersection between comics and the concerns of law and justice is one that has received little critical attention." In response, Giddens, who is a Law Lecturer, has just set up the Graphic Justice blog which he hopes will enable researchers, practitioners, and other interested parties from around the world to express and discuss issues relating to the intersection of comics with law and justice. The blog forms part of his ongoing research, which focuses upon the use of various forms of popular culture (such as TV, film, and literary fiction) as alternative discourses on issues in the interdisciplinary field of criminal justice, and has particular interests in criminal responsibility, criminology and the medium of comics. "The aim [of the blog] is to bring together people from across the globe and enable the sharing of ideas, thoughts, and research," he explains in his initial post. "Themes of public protection, justice, and punishment are widespread in mainstream superhero narratives (think Justice League of America, Superman, or Spider-Man)," he notes, "but there is also a wealth of graphic literature beyond the spandex-wearing mainstream that, like other artistic media, deals with all walks of human life (the work of the Hernandez Brothers, for instance, or Ghost World, or the Pulitzer prize winning Maus). Indeed, from the mainstream western comics that inspire Hollywood films, to the diverse and multi-layered world of Japanese manga, or the rich history of French-language bandes dessinées, comics have permeated our global culture (consider the huge cultural impact, for example, of Batman or Tintin)." "Moreover, the blending of words and images in the very form of the comics medium itself may pose important questions about the limitations and interpretation of textual language-fundamental issues for the highly text-dependent discipline of law. Add to all this the complex intellectual property issues involved in this collaborative and methodologically varied medium, and the lack of interest seems clearly to be one that is in need of a remedy. "The remedy is this: Graphic Justice." Gidden has now put a call to academics and other interested parties for anyone interested in the intersection of justice and graphic fiction. Whether you work in legal studies, philosophy, cultural studies, penology, law enforcement, art, criminology, sociology, imprisonment/corrections, or literary studies, if you're interested in comics and the concerns of justice, he says this call is for you.
" An international and collaborative space has been set up where interested parties can submit ideas and post articles, where contacts can be made and networks built up, understanding can be nurtured, and the intersection of comics and justice can be mined, examined, questioned, and developed. "Depending upon levels of interest, the project may include seminars or dedicated conference streams, or even a full Graphic Justice conference," he enthuses. "The aim is to gather together academics and practitioners, interested parties and artists, and to promote discourse and engagement on this expansive and under-researched area. • The international and collaborative space can be found at graphicjustice.blogspot.com, and you can contact Graphic Justice via the comments sections on that website, or via email to thomas.giddensATsmuc.ac.uk. On sale now from publishers Telos Publishing is The Comic Strip Companion: The Unofficial and Unauthorised Guide to Doctor Who in Comics: 1964 — 1979. Written by New Zealand author Paul Scoones, the book documents the early history of one of the world's longest-running comic strips – and certainly, perhaps, the longest-running licensed science fiction TV-inspired comics. First launched in the pages of Britain's TV Comic in November 1964, the comic strip version of Doctor Who is just one year younger than the television series on which it is based. This is its story. 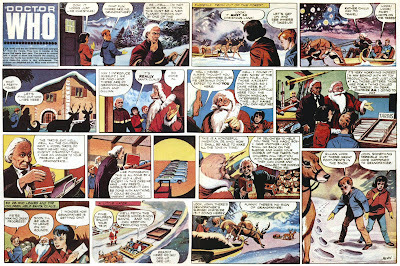 Paul's book chronicles the first 15 years of the Doctor Who comic strip from its origin in TV Comic to just before the ongoing strip was launched as a regular feature in Doctor Who Weekly in 1979. 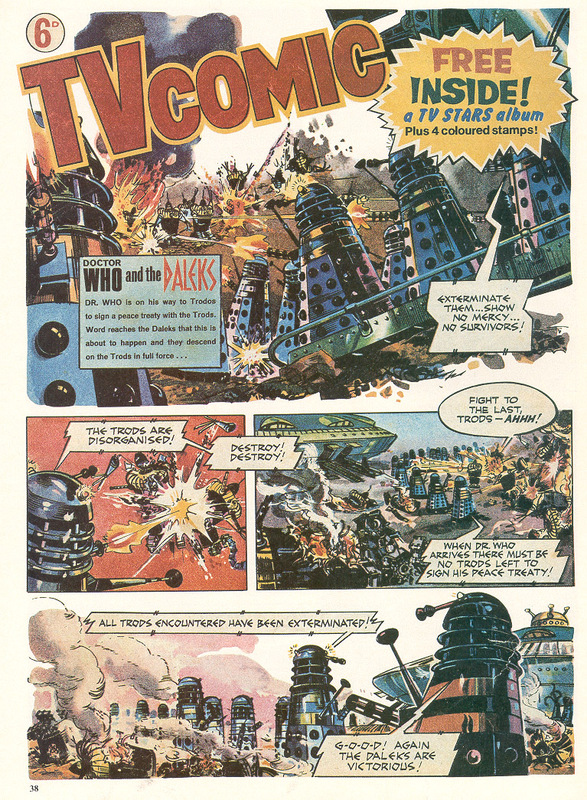 During this time more than 200 comic strip stories were published in the pages of TV Comic, Countdown, TV Action, TV Century 21, The Dr Who Annual and the Dalek books. Every strip is covered in depth, including plot details, continuity, points of interest and analysis. Plus, for the first time, details about the creation and development of the adventures are documented, alongside comments from some of the original writers and artists. Paul Scoones (www.paulscoones.com) was born in London, England in 1968 and moved to Auckland, New Zealand in 1973. His earliest memory of Doctor Who is from March 1975 when Jon Pertwee’s Doctor made his New Zealand television debut in the first episode of Spearhead from Space. He became completely hooked on the series five years later when he started collecting Target novelisations. Paul, who lives in Auckland, New Zealand, created and edited the internationally acclaimed fanzine TSV (Time Space Visualiser – whose contributors include former 2000AD editor David Bishop and current Doctor Who comic strip writer Scott Gray) and runs the New Zealand Doctor Who Fan Club (www.doctorwho.org.nz). Paul also helped discover a film of the previously-lost Doctor Who episode ‘The Lion’ (episode 1 of The Crusade) and arranged its return to the BBC in 1999. His credits are numerous - he has worked in a bookshop, managed online retail stores such as Retrospace (www.retrospace.co.nz) with his wife Rochelle, and edited websites for an electronic appliances retail chain. and include production information subtitles for Doctor Who DVDs. He can be seen on several Doctor Who DVDs, discussing finding a lost episode and commenting on the comic strips. 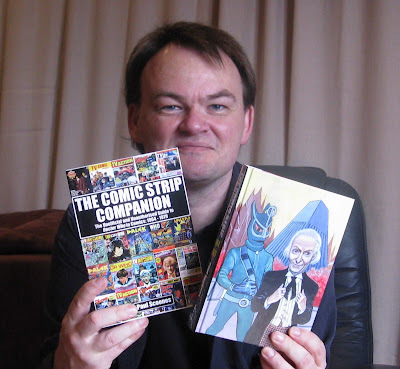 While he has had articles published in Doctor Who Magazine, In-Vision, The Handbook and Talkback, The Comic Strip Companion is his first professionally published book. downthetubes: What is the appeal of the Doctor Who comic strip to you? Paul Scoones: I’ve been a Doctor Who fan most of my life, and I’m fascinated by comics, so the combination of the two is naturally hugely appealing to me. The comic strip is a superb medium for Doctor Who. Unhindered by the limitations of television production budgets, the strip has the capacity to convey the broad potential of the series format. During the mid-1980s in particular I consider that the strip often surpassed the television series in quality of its story-telling and visuals. downthetubes: How did the 'Comic Companion' come about? Paul: I’d had the idea for a book about the comics in mind for quite a while. It was originally going to be a series of fanzine articles. As a collector of Doctor Who books, I could see that there was a gap in the reference collection. There are plentiful guides to the series on television, as well as the spin-off audios and novels, but nothing specifically about the comics, which stuck me as an odd omission considering that the Doctor Who comics have a history that is almost as long as the television series itself. What held me back from writing the book was that I felt the story needed to be told from the strip’s beginnings in 1964. Although I had a complete run from the first issue of Doctor Who Weekly in 1979, there were sizeable gaps in my collection for the first 15 years of the strip. 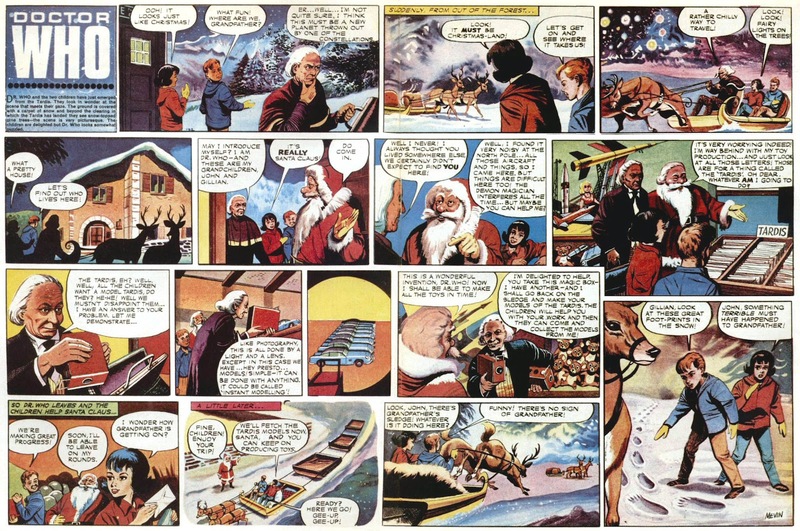 That changed when I befriended a number of Doctor Who comic collectors and through them was able to complete the set of 1960s and 70s strips. I wrote up a sample section for the book (covering the TV Comic strips from the first half of 1975), and submitted it to David J Howe and Stephen James Walker at Telos Publishing, who have a reputation for high quality, exceptionally well-researched books. They felt it was a good fit for their range and commissioned me. downthetubes: How long did it take to research - and what were the most difficult aspects of the research? Paul: The book took five years to research and write. That’s much longer than I intended, but soon after I started work I was offered work writing production information subtitles for the Doctor Who DVDs, so I ended up writing the book in between subtitle scripts. A great deal of information came to light over those five years that I might have missed out on had I finished it sooner. The book started out as a fairly straightforward story guide, but it has finished up as something far more detailed. I have gleaned a lot of hitherto unknown information from BBC Written Archives paperwork files, and from interviewing a number of people who worked on the strip. The most difficult aspect was trying to fill the gaps in the writer and artist credits. The strips very rarely carried credits, so that information had to be pieced together from various sources. The book identifies most of the creators, but there will probably always be gaps in our knowledge concerning who was responsible for certain stories. 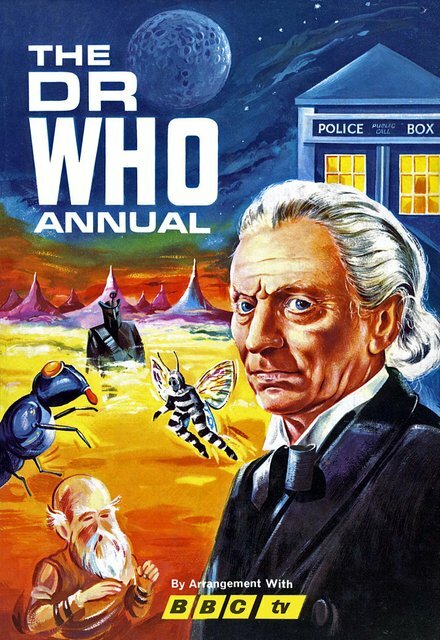 downthetubes: What was the strangest thing for you about the genesis of the Doctor Who strip that you discover writing this book? 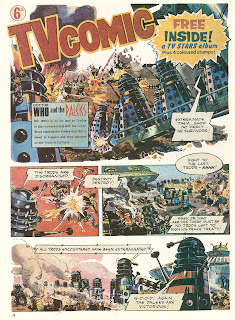 Paul: The first comic strip story proposal was rejected by the BBC for including the Daleks. TV Comic went into the deal with the BBC thinking that they had the rights to use the Daleks and prepared a storyline in which the Doctor has a return encounter with the monsters. The BBC had to point out to them that the comic strip licence didn’t extend beyond using the Doctor and his TARDIS - the Daleks were off limits. The story that ended up appearing in print was a thinly veiled rewrite of the original proposal, with the Kleptons and the Thains taking the place of the Daleks and Thals. downthetubes: Were you surprised by the amount of involvement the original Doctor Who production team had in the creation of the strip back in 1964? Paul: Yes! Before getting to see the paperwork I expected that the people making the television series would have remained hands-off when it came to the comic. That’s the impression gained from reading the strip; a number of the early stories feature magic and mythical characters that would never have been acceptable in the television series. As it turns out, both Verity Lambert (Doctor Who’s first producer) and Donald Wilson (BBC Head of Serials) were both consulted and offered their feedback. The paperwork reveals that later producers and script editors also kept an eye on the comic strip and sometimes vetoed certain aspects. One particular story, detailed in the book, was rejected outright by the production team. downthetubes: Are you disappointed that for a title with a very visual subject matter, you were not able to feature very much source material? Paul: Not at all. That might seem odd given that I’m writing about the visual medium of comics, but I’ve read plenty of books about television series that don’t have any photos, and I don’t regard this as any different. From the outset I knew that the book would necessarily have to be all text. I set out to write a book that would appeal both to readers who have not seen the comics - many of which have not been in print for decades - and also those who have the strips to hand. The book is not entirely devoid of illustrations. There is an eight-page colour section in the middle of the book featuring cover images from many weekly issues and annuals. When this feature was proposed, I immediately put together a mock-up of how I thought it should look. The publishers were impressed with what I came up with and let me take responsibility for creating the gallery’s finished pages. Fortunately, I already had scans of most of the covers and was able to source the ones I was missing. I spent a great deal of lot of time painting out creases and scuff-marks in Photoshop. downthetubes: You've been involved in Doctor Who fandom in New Zealand for some time. Is it different to fandom elsewhere and if so, how? Paul: New Zealand Doctor Who fandom is a relatively small community, with one central club acting as a hub for smaller regional social groups and individual fans. We’re country of just over four million people, and that’s reflected in the small size of the club. When I helped establish organised Doctor Who fandom in New Zealand 25 years ago, we were somewhat isolated from what fans were doing overseas, but these days many of us are involved in the wider international fan community though online forums and other social media. downthetubes: Do you have a large Doctor Who comic collection yourself and if so, what is your favourite era of the strip so far? Paul: I had a fairly large collection before I started work on the book, and have acquired a lot more since. I also collect the reprinted strips, including the excellent Panini 'graphic novel' books and the IDW colourised versions. 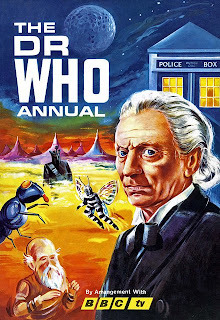 If I can cheat and go for two favourite eras - one is the sixth Doctor stories with John Ridgway as the regular artist. In New Zealand we didn’t get to see Colin Baker’s stories until a few years later, so my impressions of his Doctor were largely formed from reading that era of the comic strip I think that stories such as Voyager surpassed what we got on television. The other is the run of Eighth Doctor strips written by Scott Gray. The scope and scale of these stories is breathtaking. I adore these - they're simply superb! downthetubes: If you had the opportunity to write a Doctor Who comic strip yourself, which Doctor would you choose and which monster would you pit him against? Paul: Hmm, I think I’d go for Peter Davison’s Doctor as he’s my favourite, but also because I don’t think he was particularly well served in the strip. As the for monster, I’d be inclined to come up with some menace of my own devising, but if it had to be one from the television series, I’d go for the Cybermen. downthetubes: Finally - do you think there's any chance New Zealand-based Lord of the Rings and The Hobbit director Peter Jackson will make an episode of Doctor Who as recently reported? Paul: Having chatted to the reporter who’s researching this story it appears that there may actually be talks going on about the possibility of using New Zealand as a location for an episode or two, which if it’s true is very exciting! Peter Jackson, who’s a Doctor Who fan, has responded very positively to the idea - but would he be available to direct or could the BBC even afford him…? Time will tell! 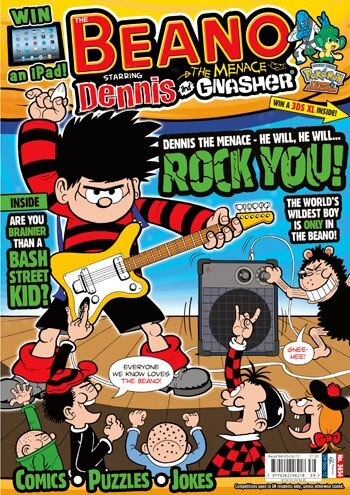 Latest Beano aims to rock you! The latest Beano (No.3654) is on sale now, with the usual mix of strips and features and offering the chance to win an iPad. 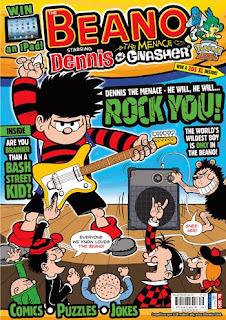 Dennis and Gnasher are trumpeting in a very different way than usual! Ed and his Numskulls have a bit HAIRY situation to take care of! The Numskulls bring you some FOUL body facts! Minnie the Minx is no ALIEN to pulling pranks that are OUT OF THIS WORLD! Are you brainier than a Bash Street Kid? Er... let's hope so. 'Specially if it's Smiffy! Roger helps you become a MODERN DODGER! Keeping Billy Whizz busy is a full-time job! 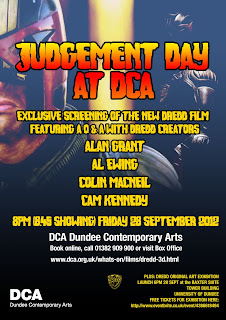 The Dundee Contemporary Arts cinema is holding a special screening of Dredd 3D on Friday 28 September 2012. The screening will be preceded by a QandA session with 2000AD writers Alan Grant and Al Ewing, and artists Colin MacNeil and Cam Kennedy. The event begins appropriately enough at 2000 hours with the screening beginning at 2045 and tickets are available via the DCA website. 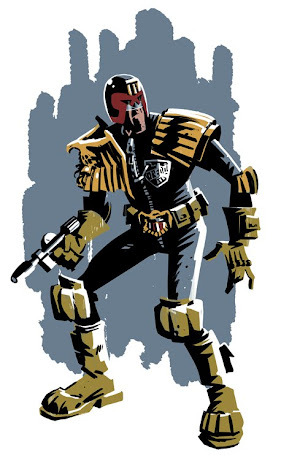 Prior to this the four creators will be at the opening of a Judge Dredd art exhibition in the nearby Tower Building of the University of Dundee. This event will begin at 1800 and is free but ticketed with tickets available via the Eventbrite website. There are more details of the Judgement Day events at their Facebook page.